Think about these issues across the whole range of activities that may be involved. Who would you involve in preventing disease and maintaining health? Where would you go for information and referrals? How would you define the different options for treatment and where would you go for such treatment? In each area, the number of providers, the value they offer, and your willingness to pay can vary greatly. Now contrast your answers to these questions with the way many executives look at their own businesses. As a typical executive, we tend to divide the world, even the world of overlapping perspectives described above, into our slice of activity. If we are, for example, a pharmaceutical company, we will look at the world according to our definition of the business system. We will look at research, development, manufacturing, marketing, sales, external relations and a host of other activities and ask how each individually or in combination creates value and/or competitive advantages that will help us to grow revenues and profits. Having said this, it is true that in many industries there has been a growing recognition of the importance of reassessing how value is created. The classic evolution involves moving from viewing products as the primary sources of value towards services as sources of value-added, and increasingly towards focusing on the overall customer experience as a potential opportunity for adding even greater (and potentially personalized) value. But is this evolution in thinking sufficient – or is it overlooking the bigger changes happening in today’s increasingly interdependent world? How much has the traditional industry view really changed, or more importantly, how much more does it need to change in the future? Let’s return to the world of health and wellness to take a look. Consider all of the different type of players that are focusing on the growing opportunities in the health and wellness value space. We define a value space as a space or market defined from the perspective of the needs of a group of consumers/customers. This value space may be served by firms in a number of different industries. Figure 1 below outlines how we might map the health and wellness value space, identifying the many different types of players operating in the space along with examples of the different value propositions that they offer. First, let’s consider the perspectives and changes happening for a number of players mapped above, who may each be focused on their particular “slices” of the total health and wellness value space. The pharmaceutical industry is a relatively large and traditionally highly profitable industry. Based on discovering (or partnering for) and developing patented blockbuster drugs, the industry is built around very high operating margins and very long lead times to market. As such, success in the industry has involved ensuring a pipeline of innovative new products, speeding the development, approval, and launch of these products as much as possible within regulatory frameworks, then selling them in major world markets for an expanding array of indications. This value proposition is rooted in the fundamental science of treating disease. However, there are growing threats to the industry, most notably pressure on health care costs favoring generics, competition to serve or “own” disease areas, and the increasing power of other players in the overall space, e.g., the ability of insurance players to impact reimbursement for treatments, and the role of doctors and hospitals in selecting and prescribing products. Yet the mindset and focus of the industry remains largely focused on its traditional value proposition: We discover, develop, and sell treatments for disease based on our scientific breakthroughs, using our strong sales forces and our strong industry lobby to influence government regulations around reimbursements. Hospitals have long been associated with large imposing physical facilities where patients checked-in for treatments more complex than those administered at a doctor’s office or requiring extended care, with the patient relationships defined by treatment regimes and length of stay. The premise of a hospital defined by these parameters is changing radically, with increasing attention to the emotional as well as physical care of patients and the environment in which care is delivered. One leading example of these changes is the Florida Hospital for Children, which highlights four aspects of its activities: (1) having leading pediatric experts on the medical staff; (2) providing child focused care; (3) having family-centered healing; and (4) having a colorful and friendly place in which to heal (including of course, some of the latest Disney characters in its Walt Disney Pavilion). According to Maria Silliman, administrator of the facility, “Our goal is to create a therapeutic environment that reflects the type of attention and care children and their families receive during their visit. With this captivating entrance, we hope young patients overcome the apprehension of a hospital stay by engaging them in a world of fantasy, imagination and adventure.” Looking further at how hospitals (or treatment facilities) and treatments are changing, there has been an explosion of specialized clinics, many with local, easily accessible branches, offering a host of treatments, from emergency care to X-Rays to dialysis and more. Medical tourism is on the rise, combining specialized facilities (often at lower cost than in major developed markets), with environments that cater to the broader recovery needs including attention to the patient’s extended caring group, including family and friends. There has also been a growing emphasis on relationships that extend beyond checkout and include remote monitoring and follow-up as well as home care. So much for hospitals being “sterile” environments, large imposing facilities, and relationships defined by admission, stay and checkout. The range and diversity of information sources on any topic related to health and wellness is vast and growing: From books, to friends, to “experts,” to media shows, to clubs and communities. With the emergence of the Internet there has been a corresponding growth of on-line sources of information and services. With names like “WebMD” or “Netdoctor,” these portals typically provide information regarding health and health care, and even include services such as symptom checklists, physician blogs, and locations to store personal medical information. The explosion of connectivity has also laid the foundation for building communities of individuals around common areas of interest, whether specific diseases or wellness regimes. Remember the day when “The doctor knows best.” Today, developing one’s own knowledge and taking a more active role in lifestyle habits, prevention, diagnosis, treatment and follow-up processes is increasingly becoming the norm. Remember when Nestle was just a food and beverage company? Now the company describes its focus as “Good Food, Good Life” and is extending its range of activities to offer information on nutrition and well being and to become involved in how products are used in the kitchen. Similarly Unilever describes its focus as “vitality,” while Danone emphasizes “health and nutrition.” For all of these players, the focus of their relationships with consumers has moved beyond simply the products being sold to each company’s ability to positively contribute to the life and well being of its consumers. Cosmetic products are just about looking better, right? Not any more. The focus of many players in this field has shifted into the area of “looking good and feeling good.” Creating a positive self-image is now clearly in the value space for overall health and wellness; simply looking good is no longer sufficient. Growth in areas such as “cosmeceuticals,” which aim to help improve the conditions which may have only been covered up in the past, is paralleled by the growth of “nutraceuticals,” such as diet supplements which may assist health. Both these areas are blurring the boundaries of value creation between cosmetics or nutrition companies and pharmaceutical players. How close will the intersection of these categories become in the future? Time (as well as science, technology and regulations) will play a big role in determining the answer to this question. The number of others players also active in the health and wellness value space continue to grow. Health and exercise clubs have extended into home training equipment. Nike and other sports equipment suppliers have got into the act, sometimes partnering with companies such as Apple and its popular iPod (with dedicated apps of course). Adventure and travel companies are entering the fray, along with a range of entertainment companies. The list of players in this field, and their competing value propositions to consumers, continues to grow. The question from our side is who doesn’t understand? 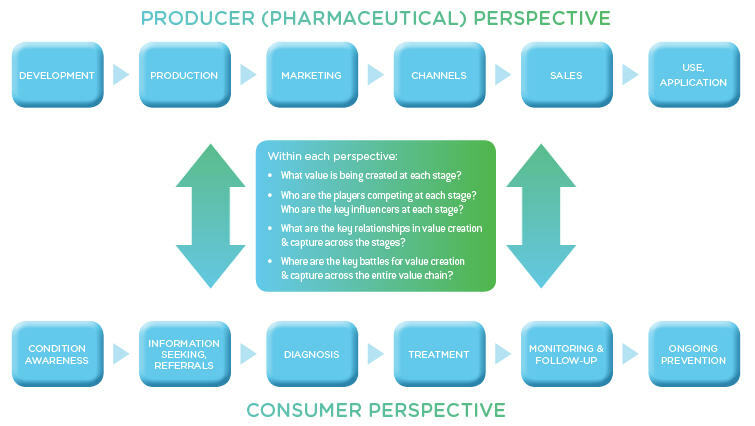 To get at this point, let’s consider two views of the value chain in health and wellness, one from the perspective of a pharmaceutical player and one from the viewpoint of an individual, i.e., the patient or consumer, as outlined in Figure 2. Each perspective highlights different stages of activity – and associated opportunities for value creation – depending on whose shoes you are in. As an outside observer it is significant to see how little overlap there is. The pharmaceutical value chain is targeting only a small portion of the overall health and wellness value space from the consumer perspective. While pharmaceutical players may say, “Of course, we can’t do everything,” there are clearly some questions to ask and opportunities to explore. 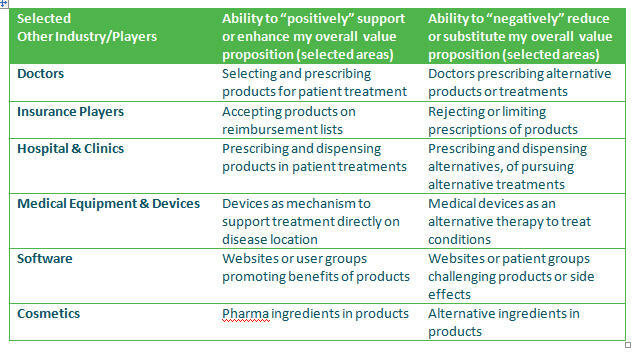 Some of the activities of the pharmaceutical player may well be truly independent of the other activities across this consumer value space, but where do value propositions begin to overlap and become increasingly interdependent (as opposed to independent)? How could a pharmaceutical player seize these opportunities – or indeed counter the challenges from other players who are encroaching on their “slice” of the pie? As a first step, put yourself in the shoes of the pharmaceutical player – bear in mind we could have asked you to be any one of the different players outlined in Figure 1. Then ask how each of the different players in Figure 1 could either significantly support or detract from your value proposition as a pharmaceutical player. 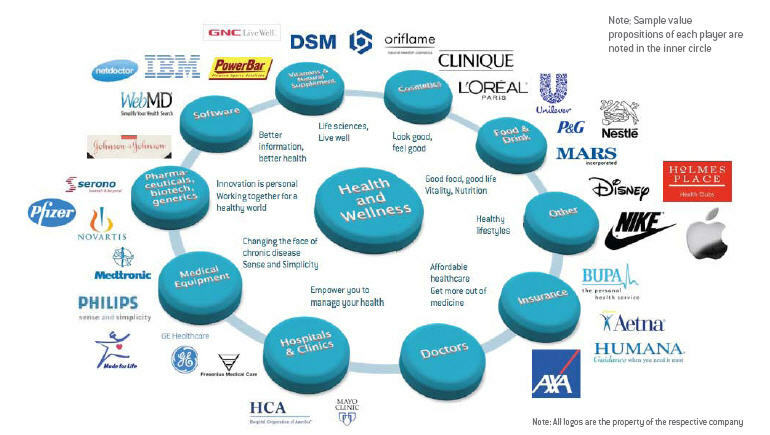 Figure 3 below highlights just a few of the potential interdependencies between a pharmaceutical player and others in the total health and wellness value space. The point is that there is growing interdependence between the activities of players in this overall value space and this interdependence is likely to grow over time. The biggest threat is to ignore all of these connections which can significantly enhance or detract from (in this case) a pharmaceutical player’s value proposition. Add on top of this all of the competitive products and services from other players in this space and we can begin to understand the importance of moving beyond our classical industry views of competition. It is tempting to say that this is just one industry example, “This growing interdependence within value spaces will not impact our industry. 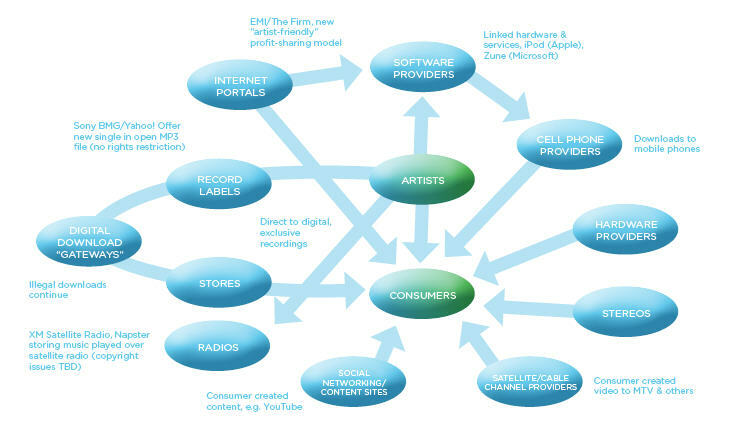 Our industry boundaries are holding strong.” Take a quick look at just one more industry – music – with a very different map, in Figure 4. Who is creating value and who will be making money in the future in this industry? Where would you invest? We would be very interested in your answer! Start looking broadly at your activity – from the consumer perspective! Take off your traditional industry lenses and look at how you fit into the lives of your customers and end users. They are, in the end, the one that defines value and pays the price for it. Create a map of your total value space. Figures 1 and 4 above are just two examples of these maps. Investigate not only how value is created within individual areas or slices but how these slices or areas are connected with other areas. Go beyond the obvious to look at activities that are close to your activity, as well as the ones that initially may look unrelated. Ask how other players can contribute to, or detract from, your value proposition. Re-evaluate how the total “game” could be changing in the future. Think about what could happen to your overall value space if a significant disruptor entered the activity. How would a Google entering your overall value space change the rules of the game? What if a competitor with the mindset of an Apple entered? Or a Ryan Air? How would that change the rules of the game in terms of how value is created and captured? Now rethink your business! Do not start with a mindset of what I CAN and cannot do today. Start with a mindset of what MUST we do to be successful in the long term. This is the only perspective that truly matters in this world of growing competition and blurring boundaries. Then create a map of how you can get from where you are today to where you MUST be in the future to win. This, after all, is the only question in strategy that really matters! Tracey Keys is Director of Strategy Dynamics Global Limited and also works with the International Institute for Management Development (IMD), in Lausanne, Switzerland, where Thomas Malnight is a professor of strategy and general management. ©Tracey Keys and Thomas W. Malnight. All rights reserved. Not to be used or reproduced without permission.